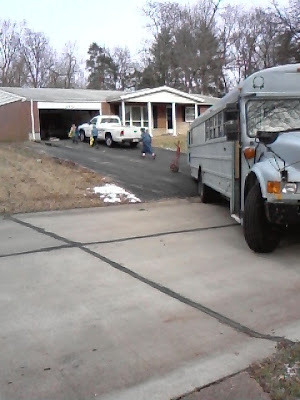 Praise the Lord, Dave and crew made it home after the boys did a quick but secure homemade fix on the brakes, saving us towing, parts and labor, and time! The arrived safe and sound by 10 pm, and we enjoyed a nice supper, Bible time, songs and 'SECRET DOCUMENTS' (currently reading 'East Wind' by Ruth Hunt). This morning, we sprung into action with our block the street maneuver which allows us to not do all the lifting required in Wisconsin. Many hands make light work!